I can remember when my little brother would sit and watch Power Rangers over and over again on the TV. He would change his mind daily as to which colour Power Ranger he wanted to be and try to recreate some of the moves in the back garden (would out much success). Fast forward some 20 years and the Power Rangers are still going strong, with a host of movies and TV series under their belt and now a brand new range of Fisher-Price Imaginext Power Rangers toys. Tigger has recently discovered the Power Ranger series via Netflix and he has been hooked. From the different colour Power Rangers to the robots and gadgets that they use he loves it all. 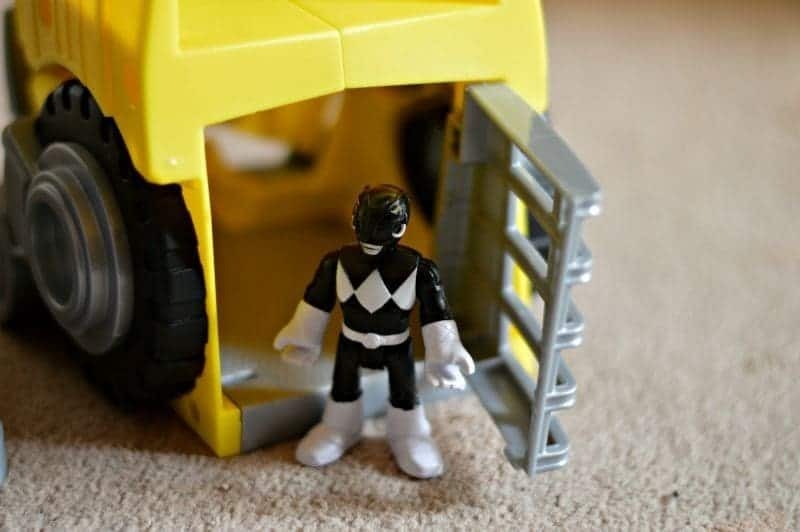 You can imagine his face then when he came home recently to find the Imaginext Power Rangers Morphin Megazord from the brand new Fisher-Price Imaginext Power Rangers toys range sitting in the living room. Unleash the fire power of the Imaginext Power Rangers Morphin Megazord on Power Rangers villains! 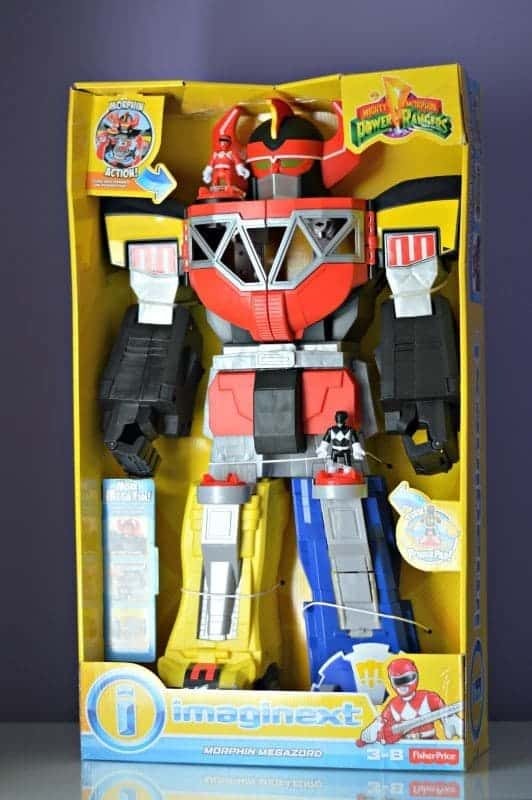 Standing at 71cm tall this Morphin Megazord makes for an impressive playset, which when you turn him around reveals further features and fun to be had. Suitable for ages 3-8 years old – although I would say it would keep older children happy as well if they were Power Ranger fans. It requires 3x AG13 button cell batteries which are included. 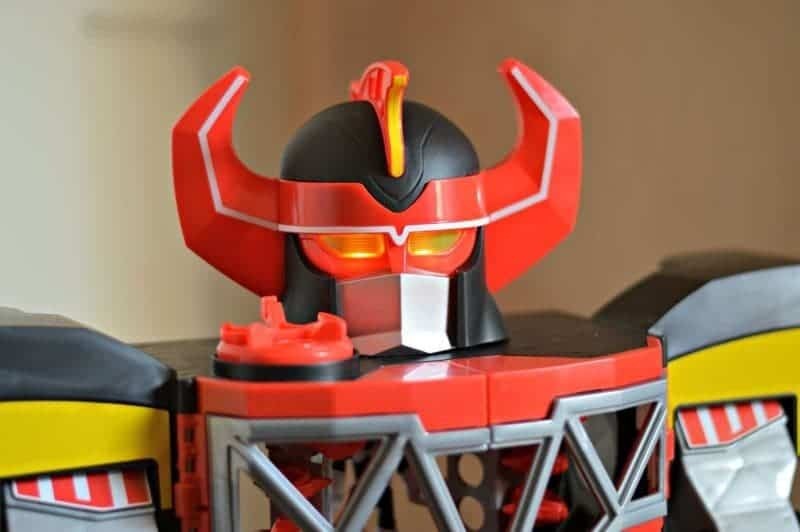 Control panel – Turn the Power Pad on Megazord’s left shoulder reveals an awesome transformation, his eyes light up and his chest “morphs” into a control panel. With a push of a button Power Missiles will fly, while turning a Power Pad in Megazord’s chest will launch Power Coins. 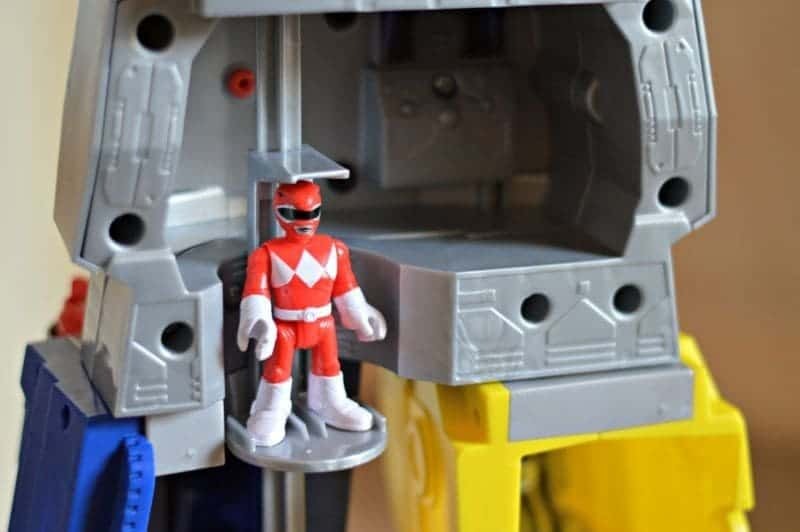 Elevator – In order to access the different levels with the Imaginext Power Rangers Morphin Megazord an elevator makes it so much easier for the Power Rangers. With the ability to stop at each level it truly is a functioning elevator. 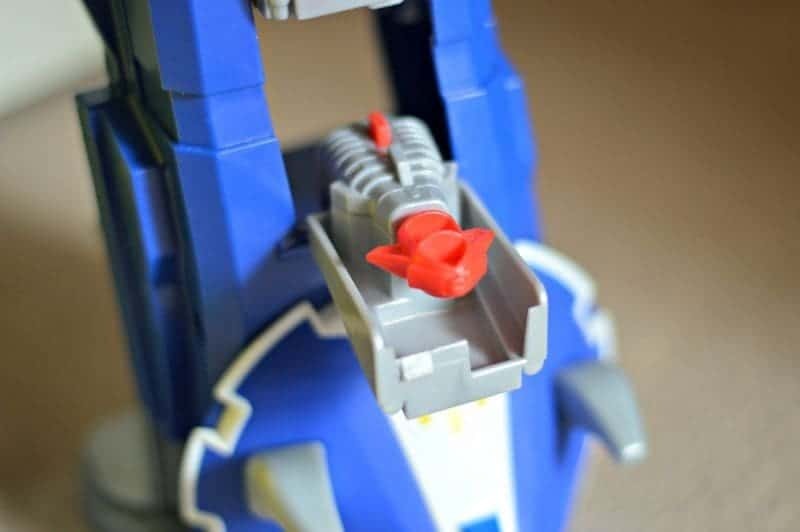 Chomping sabertooth – Push the Power Pad to see Megazord’s foot morph into a chomping sabertooth! Tigger was a little overwhelmed to see the 71cm tall Imaginext Power Rangers Morphin Megazord waiting from him when he came home from school. The playset offers several different ways in which Tigger could interact with it, from firing missiles and protecting the world, to acting as a room guard in case his sister wanted to enter without permission, as well as a role-playing aspect interacting with the various features included within the product. The power missiles and power coins that can be fired from the control panel have made for much fun especially when you have lined up teddy bears as villains to see if you can hit them! The Morphin Megazord itself is able to stand unaided with several moving parts including the head, waist and arms allowing Tigger to play with it as a robot with his own added robot voice to it too (so cute). From a parental point of view I loved that the Imaginext Power Rangers Morphin Megazord came with two Power Rangers included which meant that both Roo and Tigger we were able to play with the playset without me having to go out and immediately purchase an additional set of Imaginext Power Rangers figure pack (which retail around £8.99 for a pack of two). The Power Rangers Toy is priced with a RRP of £62.99 however is currently available for £56.99 at Argos. Disclosure: We received the Imaginext Power Rangers Morphin Megazord FOC for the purpose of review. My son has seen this advertised on TV and has put it at the top of his ever-growing Christmas wish list! Love this and know two monkeys who would do too! We are currently reviewing the Imaginex new interactive batcave! The monkeys love that too! Great long lasting toys! This is the second review I’ve seen for this toy and it looks amazing, albeit rather large (I’m thinking about storage space!!) but I know my boy would absolutely love it. Another to add to my already growing xmas list!